HomeSoftware DevelopmentWhy should businesses invest in custom software development? Gone are the days when one size fits all approach would work in your business then may it be the system, strategy or software installed in it. Customisation is the real need for an hour. When the nature of businesses is different, their operation levels are different, objectives are different then how can one packed box solution work for all? Businesses which rely on this ready to use software face issues later. They either don’t get all the components as per the functions of their business or else just due to the pressure of being bought the software, they later struggle to alter their functions. Now does that make sense? Absolutely no, so then let’s see how customised software makes sense in present dynamic times. Addresses ‘your’ business needs: Talking about custom software development means a team of experts specially engaged to deliver a product which is as per your requirements and specifications. They collect all the information of your needs, incorporate each of it into the software system and deliver you a solution which is a perfect fit for your business. All your processes, strengths, changing needs, issues, the scale of operation and other factors are taken into account while developing a software for you. Better adaptability and integration: With packed box software solutions, integration with other systems you already working with becomes an issue. Custom software solutions give you this facility, they are built to accommodate every facet of your business. They easily adjust and integrate with already running systems, eliminating the need for refeeding or duplication of the data. Competitive advantage: While using the ready software in the market, the chances are bright that your competitor is already using the same one. Now when you have the exact tools at your disposal then how can you progressively differentiate yourself in the marketplace? With custom software in your hand, you get a chance to outperform your weakness and a unique opportunity over your competitor. Security: When you choose a software system from a box store, it is evident that it has been sold to many others also for their businesses. Now when a number of people are already using it, the chances of hackers already discovering the ways to breach the system and steal the records increases. So, are you paying for a vulnerable software? With custom software, you get this advantage. The hacker will not like to put in efforts to crack a code which specifically would work on your software only and not on many. Flexibility: Whatever packed software system you buy they remain the same over the period of time. They don’t support or grow with the expansion of your business. This problem does not come with custom software. The custom software is developed with this flexibility of growing with your business. They are easily scalable as per the rising demands. 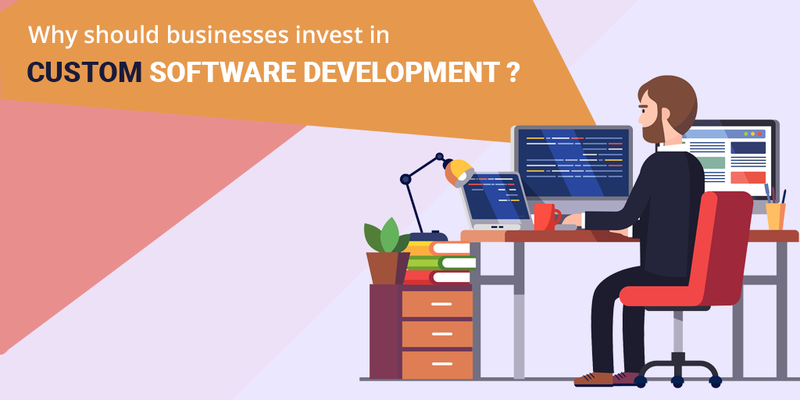 Businesses think that custom software development is a huge investment in terms of time and money but not now. With the availability of various open source platforms and other tricks, it is very easy to develop quality custom solutions that increase your efficiency, productivity and overall creativity.